iPhone Hacks: More Icons For Your Buck! March 15, 2011 donut Hacking and Jailbreaking Comments Off on iPhone Hacks: More Icons For Your Buck! The folder feature of the iOS on the iPhone is pretty neat. It helps you keep your springboard clean and tidy. You can put similar apps together or most used apps together based on what you like. However, even though the folder feature is pretty easy to use there are some limitations. The folder feature allows you to put in only 4 icons per row with a maximum on 12 apps. While 12 apps in a folder may seem enough for an average iPhone user there are ‘power users’ who possibly need some more space in their folders. For the standard iPhone you cannot do anything about it but if you have jailbroken your iPhone the possibilities increase. There are apps such as FolderEnhancer and InfiniFolders which will help you customize your folders better however can be a bit buggy at times. If you are a power user and are looking for something which will help you improve folder organization without increasing another app on your home screen then ‘More Icon Folder’ may be perfect for you. 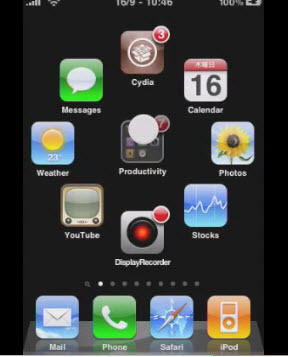 This tweak has been developed by CyberDuck and offers two important features. Firstly it allows you to add more than 4 icons per row. Secondly, this app removes the 12 icon limitation in folders. To download and install this free hack just go to Cydia and search for either ‘More Icon Folder’ or ‘Five Icon Folder’ and you will be able to download and install it. Go into Settings.app and scroll below to find the options for changing settings for this app. One very good aspect about this app is that it doesn’t add an additional icon on your Home screen. Changing settings on this app can allow you to put upto 10 icons in a row in the folder. However, be careful since things can start getting a bit too overcrowded if you did choose that. In fact, at 5 icons in a row, icons start overlapping slightly. So if you are into ‘military style organization’ of your apps then you can download ‘Multi Icon folder’ from Cydia on your jailbroken iPhone and enjoy its benefits.